Although you may have never heard of the ESP8266, it has quietly been a huge success in the microcontroller world due to it’s impressive spec and incredibly low price. It is a small wireless microcontroller with built in Wi-Fi (802.11) capability, meaning that it can not only connect to most Wi-Fi access points, but is also capable of becoming it’s own Wi-Fi hotspot, thus allowing other devices to connect to it. This means for a few pounds you can have a remote sensor/controller that has access to the internet via a standard WiFi wireless connection. 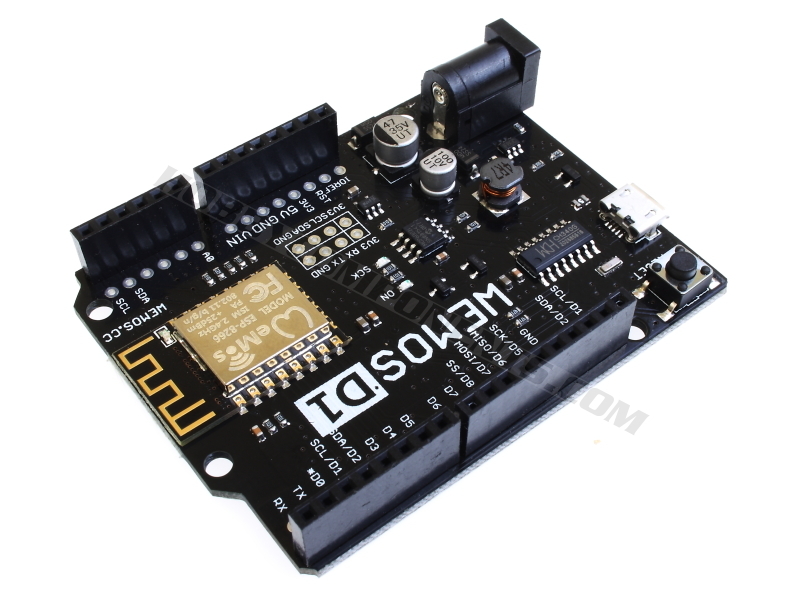 The ESP8266 comes in many forms from simple modules to full development boards. Most will come pre-flashed with firmware allowing it to be used as a simple slave device, giving other microcontrollers, such as an Arduino development board, Wi-Fi capability (see our previous blog post here http://blog.hobbycomponents.com/?p=165). But packed into this little device is an ARM processor which is more powerful than most Arduino’s that it will often get connected to. It is in itself a fully fledged development platform and doesn’t need to be slaved to any other device. Their immediate popularity has meant there has been a lot of development for these devices, part of which has resulted in third party compatibility with the Arduino Integrated Development environment (IDE). With a simple add-on you can configure the Arduino IDE to directly support and program theses devices just as if they were an ordinary Arduino. 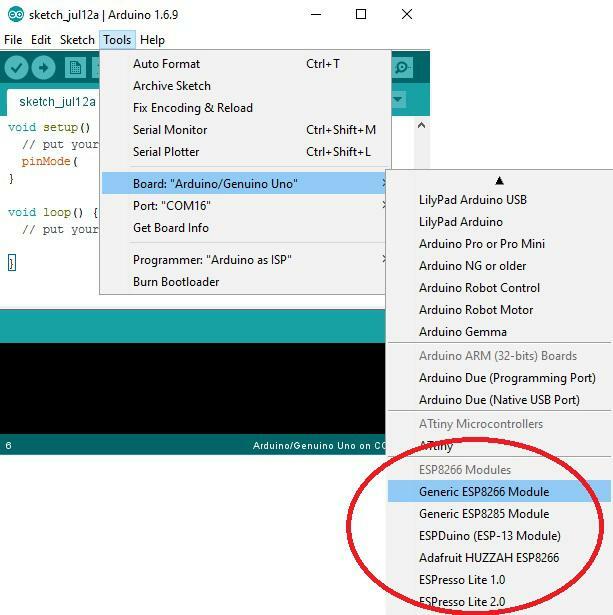 This means that if you are already familiar with programming Arduino’s, you can quickly get up and running with the ESP8266. 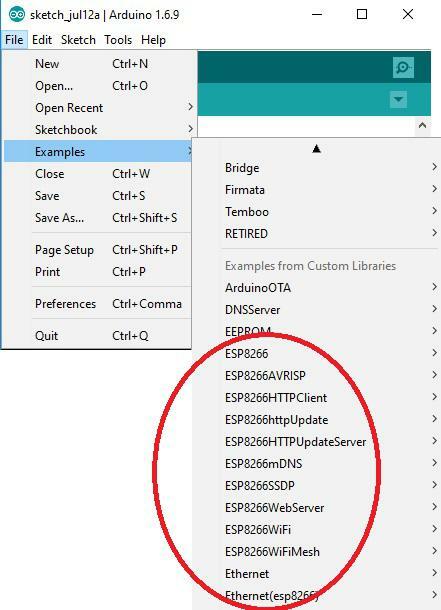 This guide will show you how to quickly set up your Arduino IDE for the ESP8266 and then use it to write and upload your first sketch. WARNING: This guide will overwrite any existing firmware within your ESP8266. It does not cover how to restore any existing firmware. 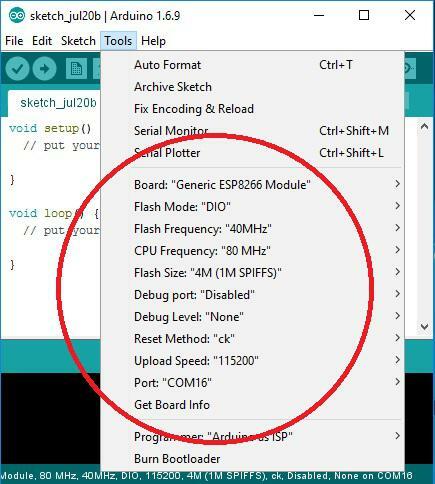 You should therefore only follow this guide if you only wish to use the ESP8266 with the Arduino IDE. ESP 8266 development board (HCDVBD0027). 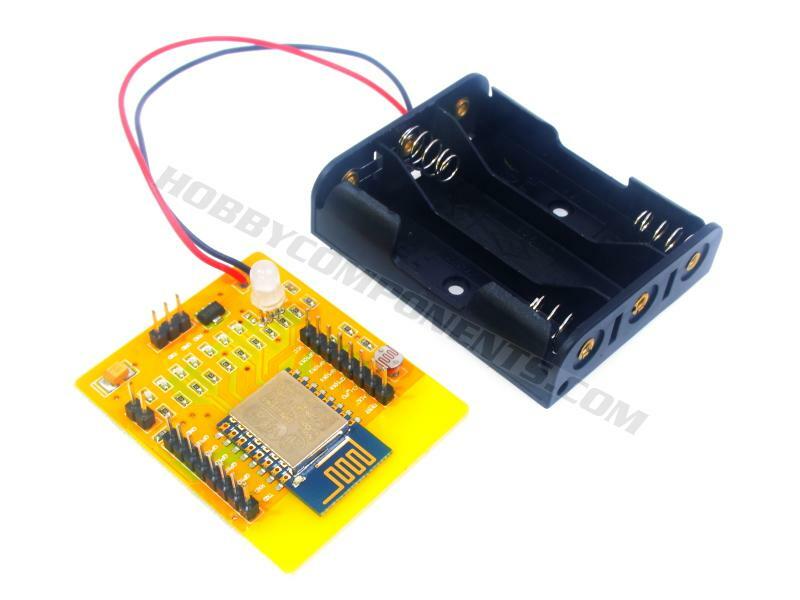 ESP8266-D1 Arduino compatible development board (HCDVBD0028). If there are any previous URLs there just add the above line and separate it with a comma. You can now close this window by clicking the OK button. 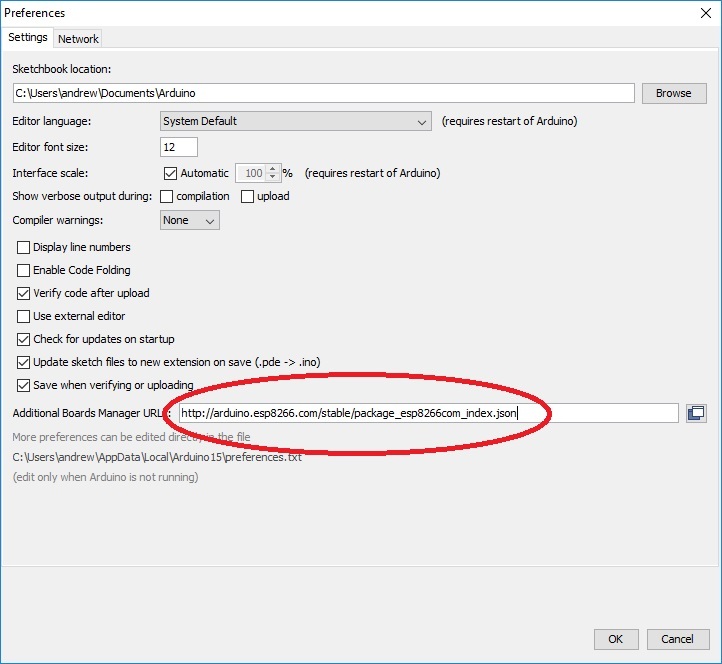 A new window will open with a list of supported add-ons. 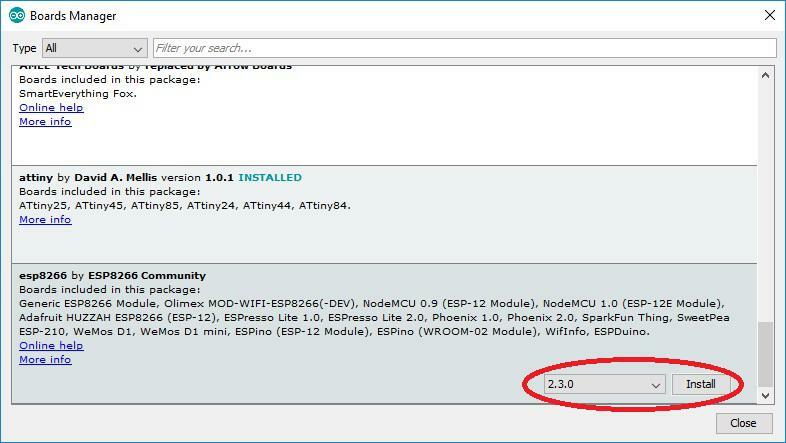 Find the package titled ‘esp8266 by ESP8266 Community’. You may have to scroll down to the bottom of the list to find it. Next, click on this package and in the bottom right hand corner you will see a version drop-down selection box and an install button appear. Make sure the latest version is selected and then click the install button. The Arduino IDE will now start installing the package. Depending on your internet connection speed this may take a few minutes. 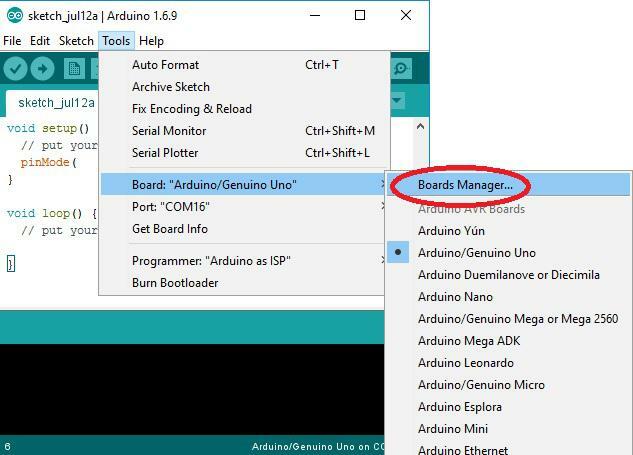 Once completed you can close the board manager window and return back to the main Arduino IDE. You will now find there are additional board options for the ESP8266 under Tools->Board. As well as new board options being added to the IDE, the ESP8266 package adds a number of example sketches ranging from a basic blink sketch to advanced webservers. 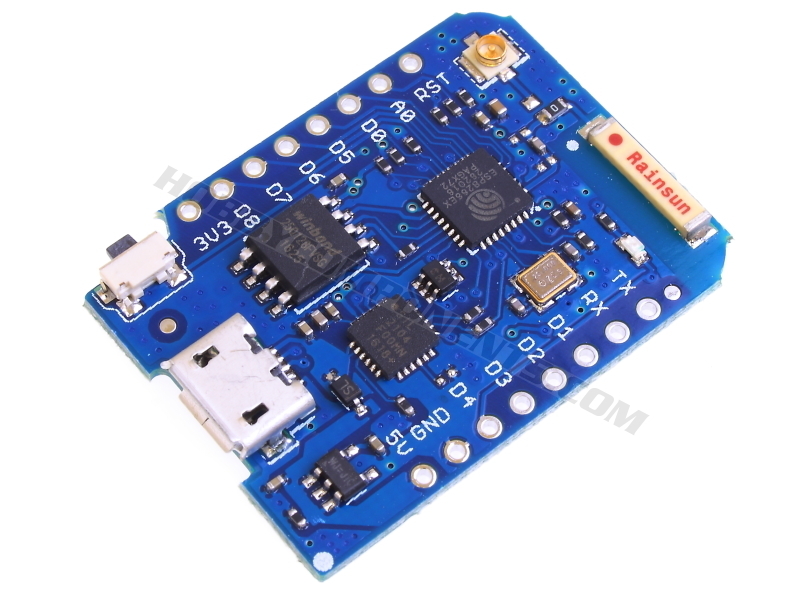 There are a large range of boards and modules based on the ESP8266 and the methods for programming them vary slightly. Therefore the following example will concentrate on the ESP8266E development board (HCDVBD0027) and the ESP8266-D1 Arduino compatible development board (HCDVBD0028). 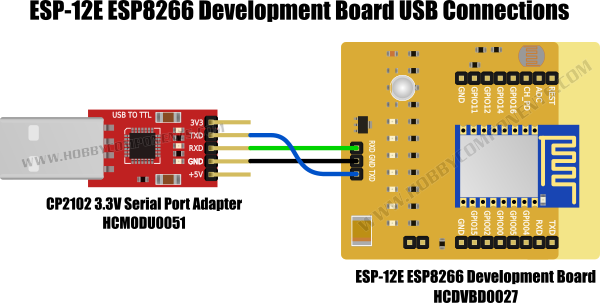 To connect the ESP8266E development board to your computer you will need a USB to serial interface adaptor. The adaptor we recommend is the CP2102 (HCMODU0051) which is specifically designed to interface to devices with 3.3V logic levels. Connect the adapter as shown in the above diagram. Note that Tx on the module connects to Tx on the development board and similarly Rx connects to Rx. The grounds of both devices must also be connected. As with most ESP8266 devices, before we can upload a sketch into the development board we need to put the board into ‘programming mode’. 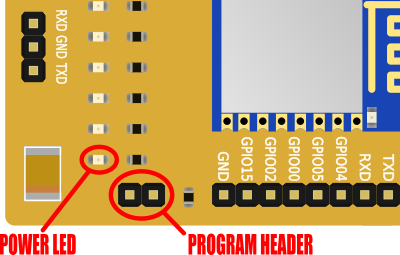 We do this by applying power to the board with a jumper inserted into the development boards programming header (by default this jumper should be supplied already inserted into the programming header). This development board uses batteries as a power source, but it can alternatively be powered by an external 3.3V supply connected to the boards VCC pin. With either option, power up the development board. With power applied you should see the power LED illuminate. Additionally the RGB LED will also glow a blue-green colour. This signifies that the board is now in programming mode. If you haven’t already, connect the USB adaptor to your computer. Note that the ‘Port’ setting needs to be set to whatever COM port is assigned to your USB interface adapter. 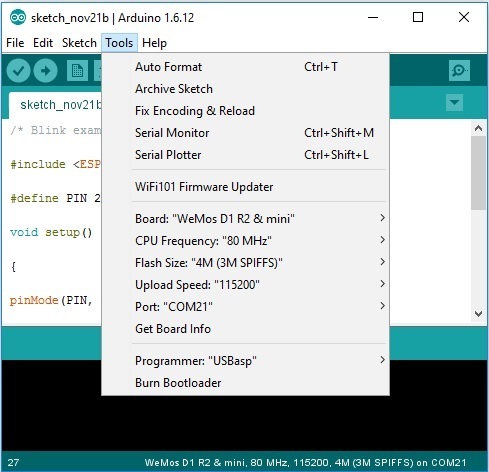 The Arduino IDE is now all ready to upload a sketch to your board. You can now jump forward to the Blink test part of this guide. WeMos D1 (HCWEMO0001) & D1 Mini Pro (HCWEMO0002) development boards. The WeMos D1 & D1 Mini Pro are programmed via their micro USB port so connection to your computer is as simple as connecting a USB cable. You will however need to install a special USB driver. The WeMos D1 uses a CH340 USB to serial device for its USB interface whereas the WeMos D1 mini Pro uses a Silicon Labs CP2104 USB to UART IC. This means that the USB driver you will need to install will depend on which of these two boards you are using. Simply download and unzip the file, plug in your WeMod D1/D1 mini Pro and when the new hardware is detected, point the wizard to the folder you just unzipped to and it should install without any problems. 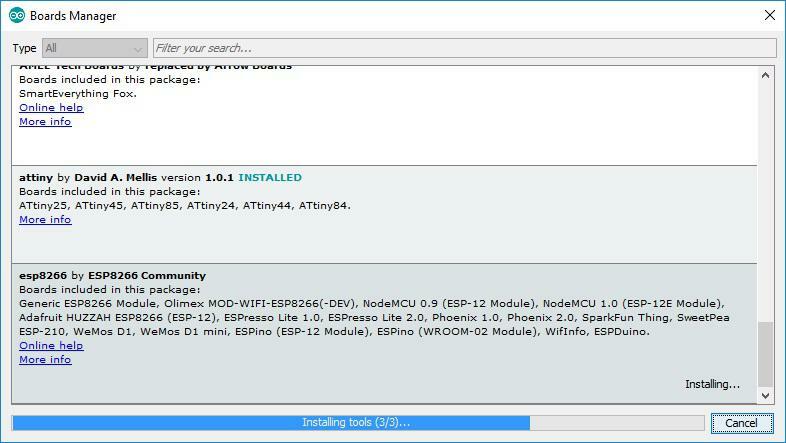 When the driver installs, it will assign a ‘COM’ port to the ESP8266-D1. Make a note of the port number as it will be needed when configuring the board settings in the Arduino IDE. Next, in the Arduino IDE go the tools menu and configure the Board, CPU Frequency, Flash Size and Upload Speed as shown above. Additionally, set the Port to match whatever COM port number was assigned when installing the drivers. The Arduino IDE is now all ready to upload a sketch to your board. You can now move on to the Blink test part of this guide. With everything configured correctly we should now be able to upload a sketch into the development board. 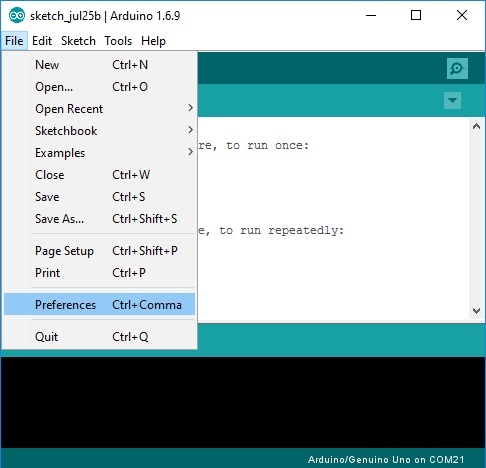 Cut and paste the following example ‘blink’ sketch into the Arduino IDE window, making sure you replace any existing code in the window with the example sketch. Next upload the sketch by clicking the Arduino IDEs upload button (round icon with a right pointing arrow found in the top-left corner of the window). If everything is configured correctly the IDE will compile the sketch and upload it to the development board. This will normally take between 15 to 30 seconds depending on the speed of your computer. Whilst uploading you may see several LEDS blink rapidly on both the development board and/or the USB interface. When programming has completed you should see the blue LED on the WeMos will blink slowly. For the WeMos D1 both the red GPIO 2 LED and the blue module LED should now blink at a rate of once per second. For the ESP8266E development board an additional red LED on the development board itself will also blink. You have now successfully configured and programmed your development board via the Arduino IDE. 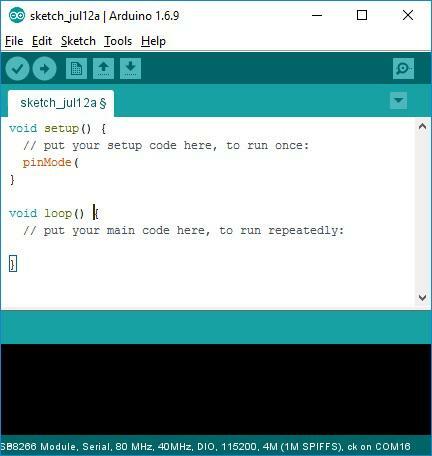 Note that this sketch is making use of the standard Arduino digital pin commands to configure and control the GPIO pin 2. You can use many of the built in commands contained within the Arduino IDE to control features of this development board in the same way you would if you were using an ordinary Arduino development board. Using the STM32 ‘Black Pill’ in the Arduino IDE!